There are several descriptions and relics that testify to the importance of sound in ancient ceremonies and structures but it is only now that we are becoming aware of the extent that it was incorporated. Recent investigations into Palaeolithic cave-art have revealed an association between areas which produce a strong resonance and the location of the art. This finding demonstrates that the properties of sound were being recognised, explored, appreciated and recorded over 30,000 years ago. The 'Harmony of the Spheres'. 'Scientists analyse 3,000 year old Conch Shell'. 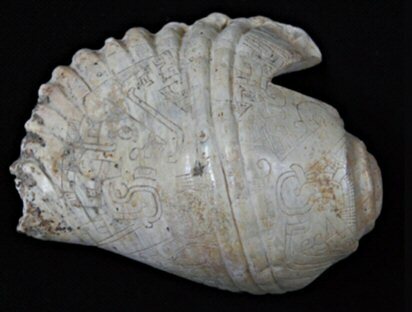 Archaeologists unearthed 20 complete Strombus galeatus marine shell trumpets in 2001 at Chavín de Huántar, an ancient ceremonial center in the Andes. Polished, painted and etched with symbols, the shells had well-formed mouthpieces and distinct V-shaped cuts. If the shells were played inside the stone chamber in which they were found, the drone would have sounded like it was coming from several different directions at once. In the dimly lit religious centre, it would have created a sense of confusion. Sonics are commonly associated in tradition with the moving of heavy stones. Examples of sympathetic vibrations in Prehistoric structures. The Great Ball-court: The Great Ball-court is 545 feet long and 225 feet wide overall. It has no vault, no continuity between the walls and is totally open to the sky. Each end has a raised "temple" area. A whisper from end can be heard clearly at the other end 500 feet away and through the length and breath of the court. The sound waves are unaffected by wind direction or time of day/night. Archaeologists engaged in the reconstruction noted that the sound transmission became stronger and clearer as they proceeded. In 1931 Leopold Stokowski spent 4 days at the site to determine the acoustic principals that could be applied to an open-air concert theatre he was designing. The Castillo: This structure is a temple that looks like a pyramid and is the one most commonly pictured on travel brochures for the Mexican Yucatan. Apparently if you stand facing the foot of the temple and shout the echo comes back as a piercing shriek. Also, a person standing on the top step can speak in a normal voice and be heard by those at ground level for some distance. 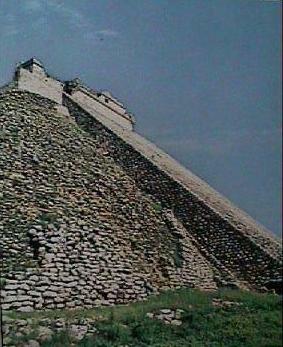 This quality is also shared by another Mayan pyramid at Tikal. 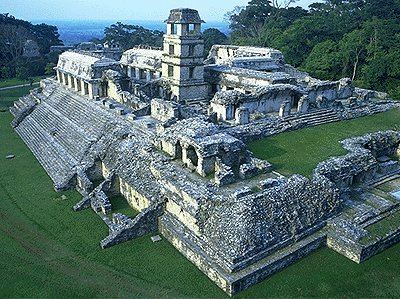 At Palenque, also in Mexico, it is apparently the case that if three people stand on top of the three pyramids, a three-way conversation can easily be held. The study of Palaeo-acoustics has revealed that several ancient structures were built so as to incorporate acoustic phenomena in their design. 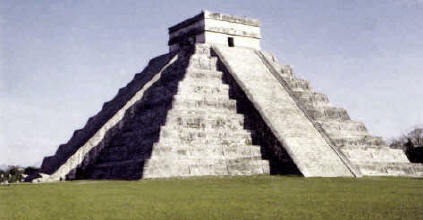 Examples such as the Hypogeum in Malta, and the Mayan Temples at Chitzen Itza demonstrate that this science was well recognised and understood. Remarkably, these same effects are now known to have been utilised at several cave systems in Palaeolithic Europe. We now know that sound was important, and probably considered magical and mysterious by, people at least as far back as the Palaeolithic (Old Stone Age) painted caves of France and Spain, dating to tens of thousands of years ago. It has been found that some of the stalactites and stalagmites in them are musical, in that they will issue pure bell-, drum- or gong-like notes when struck. Some archaeologists refer to these musical calcite formations as “lithophones”. Most if not all of these relatively rare features had been painted with geometric signs and animal figures in Stone Age times, and they also display ancient percussion marks – so ancient, in fact, that they are visible only through a covering of calcite deposits. A bird-bone flute unearthed in the Hohle Fels cave was carved some 35,000 years ago and is the oldest handcrafted musical instrument yet discovered, archaeologists say (2). Another flute excavated in Austria is believed to be 19,000 years old, and a group of 22 flutes found in the French Pyrenees mountains has been dated at up to 30,000 years ago. In addition, several prehistoric bone flutes have also been found in China. '"..S. Waller has visited rock art sites in Europe, North America, and Australia. Standing well back from the painted walls, he claps or creates percussion sounds, and records the echo's bouncing back. It turns out, that rock art seems to be placed intentionally where echo's are not only unusually loud but are also related to the pictured subject matter. Where hoofed animals are depicted, one easily evokes echo's of a running herd. If a person is drawn, the echo's of voices seem to emanate from the picture itself! "At open air sites with paintings, Waller found that echo's reverberate on average at a level 8 decibels above the level of the background. At sites without art the average was 3 decibels. In deep caves such as Lascaux and Font-de-Gaume in France, echo's in painted chambers produce sound levels of between 23 and 31 decibels. Deep cave walls painted with cats produce sounds from about 1 to 7 decibels. In contrast, surfaces without paint are 'totally flat'." "...Did the painted caves of western Europe once resound to the music of Palaeolithic chants? Such is the thesis put forward by Iegor Reznikoff and Michel Dauvois in the latest issue of the Bulletin de Ia Societe Prehistonque Francaise (85. 238-246; 1988). The authors have studied three caves in the Ariege department at the foot of the French Pyrenees. Their results suggest that the acoustics of the caves played a significant part in determining where the paintings were located, and this observation leads directly to the supposition that music or chants were important elements in cave ceremonies around 20,000 years ago. Reznikoff and Dauvois rely on the fact that in certain places ("points of resonance") the caves resonate in response to particular notes. They proceeded slowly through the cave using their voices to produce a series of notes spanning almost three octaves, from C to G3. They extended the range of notes for a further two octaves by harmonics and whistling. Where there was a resonance response, they recorded the location and the particular note eliciting the response. They used these observations to draw up a resonance map of the cave. The resonance of the caves is not in itself surprising. but the significance of the study becomes apparent when the authors compare their points of resonance with the location of cave paintings. They draw three main conclusions. First, most of the cave paintings are at or within one metre of points of resonant. The Grande Salle at Portel, for example, which gave no resonance response, also has relatively few paintings. Second, most of the points of resonance correspond to locations with cave paintings. Indeed, the best points of resonance are always marked in this way. Finally, the authors claim that the location of some of the paintings can be explained only by the resonance of that particular location. A good example is number 23 at Portel where a particularly effective point of resonance is marked by red painted dots, as there is not enough room for a full painted figure. Reznikoff and Dauvois remark from their own experience on the impressive effect of cave resonance, which would have been all the more striking in the flickering half-light of the simple lamps or tapers used by the original artists. Drums, flutes and whistles may have been used in cave rituals - bone flutes have been found at several Palaeolithic sites in Europe of roughly the same age as the paintings. The potential of cave resonance would, however, be elicited only by the much greater range of the human voice. The image of the cave artists chanting incantations in front of their paintings may not be too fanciful. Reconstructing prehistoric sounds is inevitably a risky and ambitious venture, but this study is of particular value in drawing new attention to the likely importance of music and singing in the rituals of our early ancestors. The same resonance effects as those found in Palaeolithic cave systems (above) has also been noted in the underground chambers of the Hypogeum on Malta. 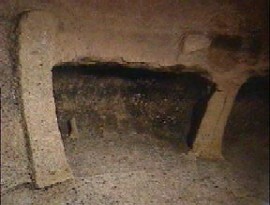 The Hypogeum on Malta contains a 'speaking chamber' which is a hole in the wall carved with a rounded interior surface. The result is that anything spoken into it produces an echo which reverberates throughout the hypogeum. It is speculated that this hole was part of a ceremonial process. Several small chambers (right) in the Hypogeum are also suspected of being used for ritual purposes as from within these cubicles, echoes from the 'speaking' chamber reverberate into a rhythm that is similar to the human heartbeat. The Megalithic Preference for 110 Hz. The 110 Hz frequency is in the baritone range – the second lowest level of the male singing voice. It is therefore possible to speculate that chanting male voices could have been used in these supposed tombs for the silent dead. Current experiments are showing that the specific frequency range around 110 Hz tends to stimulate a certain electrical brain rhythm associated with particular trance-like states. BBC NEWS Article: April 1998. 'Scattered across the landscape of north west Europe are prehistoric monuments from the Neolithic era. Stone circles like Stonehenge as well as covered burial chambers can be over 5,000 years old. Modern experimentation has shown that sound can be influential in the recovery of patients. Music has been shown to beneficial to us even before we are born and ultrasound is commonly used today to assist recovery of various ailments including repairing broken bones. (3) The traditional resistance to 'alternative' healing methods is being challenged by the results of experiments involving sound, and more interestingly, research at several prominent prehistoric sites appear to show that the connection between sound and healing dates back into prehistory. Following the 2008 Archaeological dig at Stonehenge, Prof's. Darville and Wainright proposed that the site was once considered the 'Neolithic Lourdes'. (3) In relation to this is one of the most intriguing aspects of Stonehenge, which is the question of the importance of now famous 'Preseli Bluestones', which were transported over 140 miles to the site from near Gors Fawr in Wales. The longstanding debate over the reason why stone was chosen from such a distance, when 'sarsen' stone was locally available, appears to have been met with an answer in relation to this topic, as this particular stone has a longstanding association with both healing and sound. Bluestone - or a relatively high proportion of them (perhaps as much as ten percent) have the usually rare property of being “musical”. That is, they can ring like a bell or gong, or resound like a drum, when struck with a small hammer-stone, instead of the dull clunking sound rock-on-rock usually makes. That this property has been noted locally down the generations is shown by the “Maenclochog” (“Ringing stones”) village place-name in the Preseli area'. (2) When we add this information to that provided by Geoffrey of Monmouth, who made a note in his history of Britain in 1215 AD that the 'Medicinal power of the stones was stimulated by pouring water over them'. (10). We can be sure that the Bluestones have had a longstanding tradition for being used for curative purposes. It is noted that the oldest human remains found by Parker Pearson’s team date to around 3,030 B.C., at approximately the same time as the arrival of the first bluestones (Stonehenge II). Glass has a natural resonance - a frequency at which it will vibrate easily and at which body of the glass vibrates under resonance. 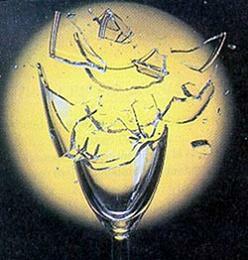 If the force making the glass vibrate is big enough, the size of the vibration will become so large that the glass breaks. The Physics of Sound Levitation: A basic acoustic levitator has two main parts: A transducer, which is a vibrating surface that makes sound, and a reflector. Often, the transducer and reflector have concave surfaces to help focus the sound. A sound wave travels away from the transducer and bounces off the reflector. 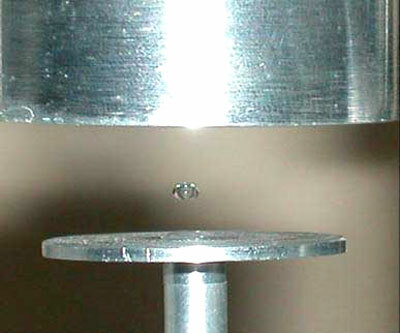 Three basic properties of this travelling, reflecting wave help it to suspend objects in midair. This is an acoustic levitation chamber, designed and built in 1987 as a micro-gravity experiment for NASA related subject matter. 'Tibetan singing bowls, ancient instruments used for meditation, can be manipulated to produce droplets that levitate, bounce and skip across water. The study began when a "sound healer" in Florida pointed out the droplet phenomenon and sent a bowl to co-author John Bush, a mathematician at the Massachusetts Institute of Technology. "We were motivated by curiosity," Terwagne says. The bowls suggest new ways to create and manipulate droplets that skitter across an air film atop a surface. After the investigators got the ultrasound field going, they used tweezers to carefully place animals between the emitter and reflector. The scientists found they could float ants, beetles, spiders, ladybirds, bees, tadpoles and fish up to a little more than a third of an inch long in midair. When they levitated a fish and tadpole, the researchers added water to the ultrasound field every minute via syringe. Huygens found that if you leave two clocks with pendulums ticking in close proximity for long enough, then they fall into perfect time, resulting in one hearing a single clock ticking. This is related to the low frequency of 1 cycle per second ( 1Hz ) frequency being experienced by both timepieces, and therefore being emitted, or radiated. The noise made by a clock is essentially a form of simple loudspeaker. The mass of it moves the air in such a way that you can hear a click. Because you can hear a click, then the same sound pressure is being applied to the case of the other clock just the same. 'A Swedish doctor, Dr. Jarl, a friend of Kjelsons, studied at Oxford. During those times he became friends with a young Tibetan student. A couple of years later, it was 1939, Dr. Jarl made a journey to Egypt for the English Scientific Society. There he was seen by a messenger of his Tibetan friend, and urgently requested to come to Tibet to treat a high Lama. Dr. Jarl stayed there for some time, and because of his friendship with the Tibetans he learned a lot of things that other foreigners had no chance to hear about or observe. One day his friend took him to a place in the neighbourhood of the monastery and showed him a sloping meadow which was surrounded in the north west by high cliffs. In one of the rock walls, at a height of about 250 metres was a big hole which looked like the entrance to a cave. In front of this hole there was a platform on which the monks were building a rock wall. The only access to this platform was from the top of the cliff and the monks lowered themselves down with the help of ropes. In the middle of the meadow, about 250 metres from the cliff, was a polished slab of rock with a bowl like cavity in the centre. The bowl had a diameter of one metre and a depth of 15 centimetres. A block of stone was manoeuvred into this cavity by Yak oxen. The block was one metre wide and one and one half metres long. Then 19 musical instruments were set in an arc of 90 degrees at a distance of 63 metres from the stone slab'. 'The radius of 63 metres was measured out accurately. The musical instruments consisted of 13 drums and 6 trumpets (Ragdons) Eight drums had a cross-section of one metre, and a length of one and one half metres. Four drums were medium size with a cross-section of 0.7 metre and a length of one metre. The only small drum had a cross-section of 0.2 metres and a length of 0.3 metres. All the trumpets were the same size. They had a length of 3.12 metres and an opening of 0.3 metres. The big drums and all the trumpets were fixed on mounts which could be adjusted with staffs in the direction of the slab of stone. The big drums were made of 1mm thick sheet iron, and had a weight of 150kg. They were built in five sections. All the drums were open at one end, while the other end had a bottom of metal, on which the monks beat with big leather clubs. Behind each instrument was a row of monks. When the stone was in position the monk behind the small drum gave a signal to start the concert. The small drum had a very sharp sound, and could be heard even with the other instruments making a terrible din. All the monks were singing and chanting a prayer, slowly increasing the tempo of this unbelievable noise. During the first four minutes nothing happened, then as the speed of the drumming, and the noise, increased, the big stone block started to rock and sway, and suddenly it took off into the air with an increasing speed in the direction of the platform in front of the cave hole 250 metres high. After three minutes of ascent it landed on the platform'. Continuously they brought new blocks to the meadow, and the monks using this method, transported 5 to 6 blocks per hour on a parabolic flight track approximately 500 metres long and 250 metres high. From time to time a stone split, and the monks moved the split stones away. 'Dr. Jarl knew about the hurling of the stones. Tibetan experts like Linaver, Spalding and Huc had spoken about it, but they had never seen it. So Dr. Jarl was the first foreigner who had the opportunity to see this remarkable spectacle. Because he had the opinion in the beginning that he was the victim of mass-psychosis he made two films of the incident. The films showed exactly the same things that he had witnessed'. Vortex rings are created by blowing a ring out of the blowhole or by flipping a dorsal fin fast enough to create a water vortex. Dolphins have been observed creating and playing with these rings by moving them around sonically and ultrasonically. They bounce the rings off walls; they elongate them with their flippers into huge, long spirals. Often, they appear to make the rings larger then swim through them for amusement.